In industries where excessive mental workload can have tragic consequences, researchers at the University of Nottingham have been investigating non-invasive and non-intrusive methods to assess cognitive demand. Their new research suggests that easily collected physiological measurements, including facial thermography and pupil diameter, correlate strongly with the operator’s perception of task demand and difficulty. With the skies becoming ever more congested, pilots and air traffic controllers have to juggle a number of tasks, with multiple tasks demanding both skill and situational awareness. Typically, operators would be asked to assess the difficulty of a task by responding to a questionnaire once the task is complete, or during a lull in the activity. 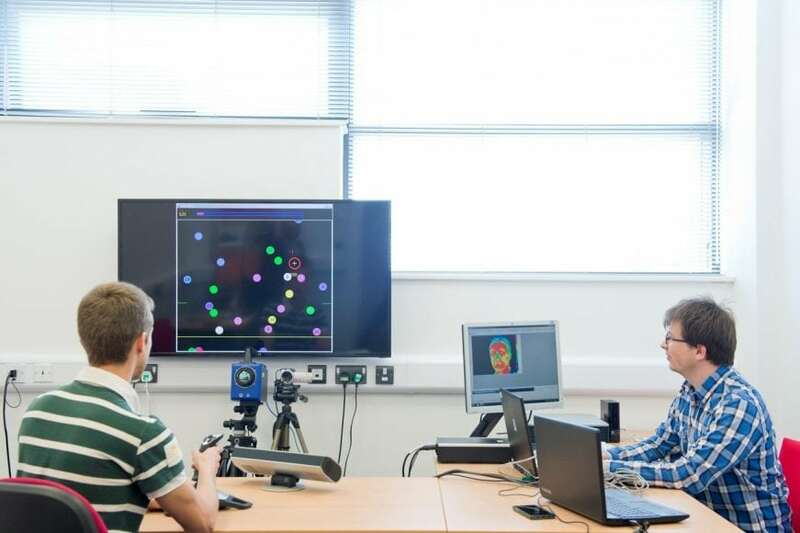 Researchers at the University of Nottingham’s Institute for Aerospace Technology and Faculty of Engineering were interested in developing a method that can estimate the demands being made without having to interrupt a task or distract the operator. Of all the methods used, it was found that facial thermography and pupil diameter offered the most promise, as they are the least intrusive. When used in conjunction with machine learning, they offer a better correlation to reported workloads. When a volunteer was asked to take part in a computer-based task combining cognitive demand with spatial awareness, the thermal camera clearly showed that as the task became more difficult there was a noticeable reduction in the temperature over the sinuses, and particularly at the tip of the nose. Simultaneous eye-tracking showed that pupils dilated as the demand increased. The drop in temperature could be due to a diversion of blood from the face to the brain or may be due to changes in convective cooling of the nose due to variations in breathing rate. To reduce the occurrence of false positives, the two measures were combined and found to correlate strongly with reported demand. The team wanted to take the research further to develop automated systems to assist operators and their supervisors at times of excessive workload. These findings are described in the article entitled Physiological Parameter Response to Variation of Mental Workload, published in the journal Human Factors. This work was led by Adrian Cornelius Marinescu and Alastair Campbell Ritchie from the University of Nottingham. My current research focuses on the effect of mechanical environment on cells and cell-biomaterial constructs. We have recently developed a new bioreactor which is able to exert compressive stimulation on cells grown on softer substrates, in addition to existing research on bioreactors providing tensile and torsional stimulation. In addition to the bioreactors themselves, we have also developed flexible substrates, allowing the effect of mechanical strain, and the response of cells to substrate flexibility/anisotropy to be studied.